I was rooting for the affair. That's how awful Zeena was. I've never, ever in my life found myself on the side of an affair. But then Ethan Frome happened. 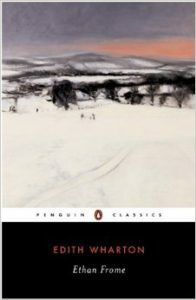 And in just 100 short pages, Edith Wharton created a character so despicable - bitter, querulous, dislikable - that my negative opinion of her nearly outweighed my unwavering belief in the sanctity of marriage vows. I was surprised at how short the book was. Somehow I assumed that something written in 1911 would be long and cumbersome. But even more surprising was how quickly I was drawn into the story. Wharton's near perfect writing makes the story come alive. I was quickly transported to the dreary, bitterly cold New England winter. * I could easily picture the small town of Starkfield. Through a few carefully chosen words, Wharton depicts an intense and forbidden and ultimately tragic love affair. This tiny book leaves an enormous amount unsaid, which made room for my imagination to fill in the details. I've never found a better example of "less is more." *I'm home writing this review because the city is closed due to a blizzard. How apropos.